Good Evening. I would like to begin my talk today on the Red Fort of Delhi, once called ‘The Most Magnificent Palace in the East’ with an image, which most of us present here―if not all of us―will instantly recognize. In fact, so would four year old children across the country who have just entered formal school! This image is a part of the Red Fort’s outer walls—the Lahori Gate, to be precise, atop which the Indian Flag proudly waves. Each Independence Day, it is this view of the Fort that we salute, that is telecast through the country and routinely printed on the front pages of our newspapers. Ironically, however, this overwhelming focus on the Red Fort as a national icon bound so inseparably with the identity of independant India and its struggle for freedom against British rule, has actually directed attention away from its unique design. A design which has inspired at different times and varying levels, all manner of art and architecture within and beyond the Mughal Empire—Sikh religious buildings, Rajput palaces, residences of noblemen and of ordinary people. All representations of the Fort since then, whether in drawings of 19th century Delhi that we just saw, or the Delhi Tourism’s official calendars in the 20th century, have been defined by this forbidding veil in front of its public Gateways, which was made even more opaque by the British during their takeover of the Fort. This occured in 1857, a little more than two hundred years after the founding of the Fort. I would like to draw aside this veil, which has obscured not just the physical view of the Red Fort’s interior, but also changed its relationship with its city of Shahjahanabad, and take you within the huge Fort today. To revisit the spaces in it and give you some idea of what it contained originally, what it symbolized in the Mughal way of life, why the pioneering British historian-explorer James Fergusson termed it ‘the most magnificent palace in the East’, what is its relevance today and how it should be regarded and conserved. This understanding of the Fort that I am going to present has been pieced together after sifting through the various depictions of its past existences available today—including the Mughal dynasty’s court routine recorded in official court chronicles and Mughal miniature paintings, and personal diaries of individuals associated with the Fort, European travelogues, photographs and drawings—and after studying the original Mughal structures that presently exist in the Fort. Interestingly, a map dating from the eighteenth century exists in the Oriental and India Office Collection at the British Library which serves as a fairly accurate illustration of the current incomplete perception of the Fort. It also appears to eerily foretell the Fort’s tragic future. In this map, the artist has chosen to draw only the Fort’s outer walls (simplified into a rectangle) enclosing a blank open space inside! We can only surmise about the reasons for doing so. Perhaps it is an incomplete drawing based on a fleeting visit with no time for detailed observation? Perhaps the artist was disallowed from entering within the Fort yet was sufficiently impressed with the sight of its vast red circuit to record it willy-nilly in some form? Perhaps the artist was more interested in recording the Fort’s boundaries and the gardens around it? Whatever the reasons for representing the Fort in this manner, the interior of the Red Fort has changed so radically since then, that today, it resembles the empty space in this map to an astonishing degree. The actual profile of the Fort and the density and variety of the original spaces and structures within it, may be seen in a map of the mid-1840s, one of its most detailed representations. Unfortunately, only a miniscule number of these original elements of the Fort exist today, as you may see in a redrawn version from the same map, where the extant structures have been highlighted. This radical transformation of the Red Fort occured a hundred and fifty years ago, perhaps at a time when our great-grandfathers or our great-great grandfathers were alive. In a culmination of the repeated plunder that the Fort suffered due to its position as the foremost seat of the Mughal Empire and the fame of its decorative and material riches, the British, after their victory over the last Mughal ruler, Bahadur Shah Zafar in 1857, indulged in deliberate desecration at an incredible scale. In 1860, a little more than two years after they took over the Fort, they passed an order to demolish not only all buildings within 500 metres around the Red Fort, but also more than eighty percent of its original pavilions, colonnades, gardens, gateways and courtyards. Barracks for the British army stationed within the Fort were made in their place. The transformation that this act caused can be understood more clearly when we compare the number of structures and the manner in which they exist today, with the original configuration. The built structures have been shaded black in the plans of the Fort, before and after the destruction. A photograph of the area from the top of Jama Masjid shortly after the demolition also shows the empty spaces around the Fort, making it an island severed of its connecting links to Shahjahanabad. Within the Red Fort, the few Mughal structures that escaped total demolition, were looted of their valuable and decorative effects. Stripped of their gilded copper domes, the precious stones inlaid in their walls, their carved marble panels, they were used as military prisons, canteens, refreshment rooms, mess lounge, hospitals. Even after first being restored in the early 20th century, to present the Fort as a showpiece to visiting British royalty and aristocracy, they were mere shadows of their former selves. They continue to exist today as a strange mélange of a few forlorn pavilions amidst stern barracks, temperamental lawns, groups of trees, tarred roads and stagnant water. Thus, even the Fort’s custodians today may find it easier to relate its official title of Qila-i-Mubarak, the exalted fortress, with the earlier Mughal Forts such as those in Agra and Lahore which seem more imperial. It is only by resolutely ignoring the later intrusions and carefully examining the original components of the Red Fort, that one can discern and appreciate their beautiful proportions and the remnants of their stunning and intricate craftsmanship. Shah Jahan and Aurangzeb thus, would have been many, many times more fascinating. How was it that the Fort’s designed form and function continued virtually unchanged for two hundred years? That, even when its buildings were shorn of much of their trappings and decoration, their formality diluted with additional structures constructed in an inferior architectural style, when their ruler was in many ways just a figurehead with little money or actual authority, they were still impressive enough to be widely admired? Not only the inhabitants of the city for whom the Fort symbolised much more than its physical appearance, but even the marauding British soldiers intent on plundering it in the days after its last Mughal ruler, Bahadur Shah Zafar was defeated and imprisoned, regarded it with awe. Some of these soldiers later recorded their memory of its ‘gorgeous domes and minarets’, ‘the vast size of this castellated palace with its towering embattled walls’, just as Lady Emily Bailey, the daughter of the powerful British Resident, Sir Thomas Metcalfe who first saw it in 1848, recollected its ‘sublimely beautiful buildings’. These images of the palaces and pavilions in the Fort, which she unreservedly praised as‘exquisite buildings of white marble ...in the style of the Taj’ p. 168 were commissioned for her father, Sir Thomas Metcalfe, barely a decade before it was destroyed. Photographs of these buildings from the mid-nineteenth century also show the complexity, density and beauty of the spaces in the Fort. Before speaking of the attributes of the Fort’s design which allowed it to retain its original form for all these years between its founding and these pictures, we need to first comprehend the circumstances and times in which it was established, and its importance in the Mughal empire. To begin with, we must realize that right from its conception, to its construction to its functioning, the Red Fort is unrivalled anywhere in the world. It was designed and built as a holistic venture along with an entire city—the only such urban Mughal palace complex of its kind. The construction of the Fort was finished in just 10 years. In itself this is a huge venture, as I am sure we can all appreciate especially when we compare this to contemporary construction. Imagine an entire city and palace being constructed in 10 years today, even with the aid of modern technology! However, apart from the remarkable managerial and construction skills manifest in the building of the Red Fort, the fact that it and Shahjahanabad were planned and built at one time, allowed Shah Jahan’s builders to not only address all the problems of access, or overcrowding in the earlier, older Mughal cities and Forts such as in Lahore and Agra but also to plan for future expansion and to provide a magnificent enough setting befitting one of the richest and most cultured medieval kingdoms in the world. All the earlier forts established by the Great Mughals, whether at Agra, Lahore, Allahabad, were built over the reigns of different Mughal rulers and were therefore amalgamations of various styles and modes of construction. The architectural forms and spaces which had been experimented with in the earlier Forts, were thus brought to fruitition in the design of the Red Fort. 2. The Red Fort may therefore be said to be the grand finale to imperial Mughal forts, just as the Taj Mahal, Shah Jahan’s most famous act of patronage was the grand finale to imperial Mughal tomb-gardens. The Fort set the trend for domestic as well as ceremonial architecture all over the Mughal empire; and for subsequent and contemporary kingdoms in the sub-continent. In fact, in its original form, many parts of the Red Fort had the same quality of refined luxury as, the Taj Mahal still does. Like the Taj, the Fort was crafted and built with perfect proportion and detail, by an imperial array of master-craftsmen, master-masons and overseers. When the Fort’s foundations were marked out on the 29th of April 1639 AD, during the second decade of Shah Jahan‘s reign, its design was reportedly led by the master-architect Ustad Hamid and his brother Ustad Ahmed Lahori, who, some sources claim was associated with the building of the Taj Mahal too. Records show that the best craftsmen and designers decorated the Red Fort with Fatehpur Sikri sandstone, the finest Makrana marble, glass imported from Allepi, and a range of semi-precious stones, gold and silver from all over the trade centres associated with the Mughal empire. The same care that Shah Jahan commanded his trusted aides, master-masons and artists to expend on the mausoleum of his beloved wife, was used to craft his living areas and those of his family. Shah Jahan’s official court-histories record how he often made detours in his administrative or political visits, so that he could inspect the construction at the Fort. contemporary acts of building. The Taj was finished barely two years before Shah Jahan grandly celebrated the completion of his magnificent Red Fort in 1648. Both the Fort and the Taj were thus, created at the peak of Shah Jahan’s patronage, a period universally recognized as one of the pinnacles of world art and architecture. They represent the highly evolved design consciousness of Shah Jahan and his team of architects, artisans, craftsmen and artists. 4. However, the Fort was simultaneously far more complex and intimate than even the Taj Mahal. While the Taj was essentially designed as a mausoleum set within a Mughal garden, with its mosque and ancillary supporting buildings, the Red Fort was composed of many more kinds of buildings, gardens, spaces and functions. Not just a tomb or a garden, or even a mere imperial residence, which is the ordinary western conception or definition of a palace, the Red Fort was like a city within a city. It was designed to function simultaneously as a showpiece of the Mughal empire, the residence of the Mughal imperial household, an administrative centre, recreational space, as well as a cultural focus for Shahjahanabad. To put this into context, we can compare the Escorial, one of the largest palaces in Europe, constructed in the reign of Philip II in the mountains above Madrid in 1563, about eighty years before the Fort. Its size at 204 metres by 162 metres (670 feet by 530 feet), made it closer than most other renaissance royal buildings to the scale of a small city. Yet it was five times smaller in area than just the inner palace of the Red Fort. 5. The Red Fort thus contained palace pavilions, imperial gardens and art objects to cater to the daily needs of the Emperor, his queens and his daughters, as well as administration halls, courts of justice and formal halls of audience. Additionally, it also housed more prosaic functions such as offices, retail markets, mosques, kitchens, elephant and horse stables, orchards, living quarters for the resident soldiers, maids and attendants who worked within the Fort, and karakhanas and workshops for skilled craftspeople who made objects specifically for imperial use. Kings, noblemen, petitioners, soldiers, ambassadors, stone-setters, jewellers, maids, weavers, even the poorest of the poor residents, came to work, to seek justice or to pay audience to the Emperor as part of the daily ceremonial custom at Shah Jahan’s court. The true significance and the scale of these activities can be appreciated when we realise that this is akin to it being a combination of the Rashtrapati Bhawan, North and South Blocks, Parliament House, Supreme Court, Secretariat, Cantonment, Crafts Museum, etc! 5. The Fort was actively and almost continuously used as an imperial Mughal Fort for almost two thirds of its life—Shah Jahan chose to live in the Red Fort for a greater part of his remaining 10 year long reign, till he was deposed by Aurangzeb. Most of his later descendents too stayed here. All through these years, the multifarious activities within it continued to work practically as they were originally designed, without intruding on each other. Despite the huge daily traffic of visitors-great and small, from within the city and beyond the boundaries of the empire–nobody got into each other’s way within this mini-city. 6. This was possible because the Fort was thoughtfully designed to accomodate public, semi-public, semi-private and private spaces. The public ceremonial areas were clearly and centrally positioned, marked out by straight axes, with formal courtyards that increased in size and magnificence, a succession of compelling gateways which no visitor could miss or ignore. On the other hand, the private areas, whether those of the Emperor and his family or of his attendant work-force, were located such that they were practically invisible. Shah Jahan’s living areas and palaces were atop the river-side wall, furthest from the Lahori and Delhi Gates of the city. Instead of being conventional huge towering vertical complexes, they were single-storeyed pavilions, their imperial status signaled not by size but by their proportion, refinement and detailing. His private entrance to the Fort was also from the banks on the river, which was an important recreation and transportation space. In fact the siting of functions throughout Shahjahanabad celebrated the presence of the river. The Fort’s imperial pavilions on its riverside were not only located to afford stunning views across and cool breezes from the river; they were equally part of a grand spectacle from the river, their privacy unimpaired behind intricate marble jalis. This river-views were continued in the large havelis of noblemen and Princes, public and private gardens, and ghats, all of which lined the length of the Yamuna. In contrast, the living and working areas of the craftspeople and attendants were located beyond the high entrance streets off the Main Gates in the shadow of Fort’s towering outer walls adjacent to the city. They were densely built around twisting streets, resembling parts of the city outside the walls of the Fort, yet positioned in such a way that they were shielded from the view of state visitors and even of the Emperor who, despite being the lord of the entire Fort—as indeed of the entire empire—never needed to go into these parts of the Fort which could thus develop freely. These drawings show the areas of movement of different categories of people within the Fort‑the Emperor, a nobleman, a Mughal queen, and an ordinary inhabitant of the city. The Fort was thus a microcosm of the Mughal way of life–not merely the Imperial Mughal way of life. 7. Each sub-area within the Fort had its own courtyards bounded by gateways and continuous arcades that not only provided shaded areas to work, sit or walk in, but also privacy from the other spaces around them. The open courtyards and gardens also had the advantage of flexiblity; if there were more crowds such as on the Fort’s inauguration ceremonies or at Shah Jahan’s birthday celebrations or during festivals, by spreading canopies and qanats, more covered area could be easily and quickly obtained. Thus, open space was fashioned and designed such that it was used as an extension of built space—and built space shaded or enclosed open space so that it could be used effectively in all seasons. It was also because of these open areas sited in between built areas, that many of Shah Jahan’s original pavilions could stay virtually unobstructed and untouched, despite a greatly increasing population in the Fort during the times of his descendants. It was around the boundaries of some of the main courts and gardens or within many of the less visible ones that the later Mughal rulers and their sons and daughters got more structures built. The built spaces too, whether the grand entrance forecourts and gateways, or the Emperor’s own pavilions were multifunctional in use. Thus, the Lahori and Delhi gateways contained living quarters for soldiers, the Naqqar Khana Gateway not only provided a regulated entrance but also contained chambers for musicians. The Emperor’s Hall of Private Audience from wheer he dispensed justice also doubled up as a reception on the occasion of private celebrations. All these buildings that the Emperor stayed or worked in were not enclosed buildings but pavilions, a series of verandahs, which could be hung with carpets and covered with qanats, or left open to let the river-breezes in. 8. Thus, the location and orientation of the buildings, gardens and courtyards that housed all these different activities, as well as their size, height and overall proportions, had ecological, functional, and aesthetic reasons. They were designed not only to impress a viewer or a user but also to be easy to maintain and to be lived in during the different seasons. They were practical as well as beautiful. As the Fort’s original design shows, the proportion of open spaces in it is far greater than the amount of built structures A large amount of these open spaces were gardens, which were designed to provide pleasant and cool spaces; they are described by contemporary historians of Shah Jahan as being planted with, ‘...fruitful trees of diverse kinds...interlaced with each other in such a way that they sky is not anywhere visible from under them’. They were not just beautiful to see and to use, but also provided fruit and vegetables for the kitchens. In fact, Shah Jahan is recorded to himself go and pluck fruit from his gardens with his page boys early in the morning as a diversion from his more onerous administrative duties. All these qualities make the Fort not just an epitome of urban architectural patronage in Shah Jahan’s reign, but also represent one of the finest examples of a sustainable way of planning, building, and living. Why do I say that? 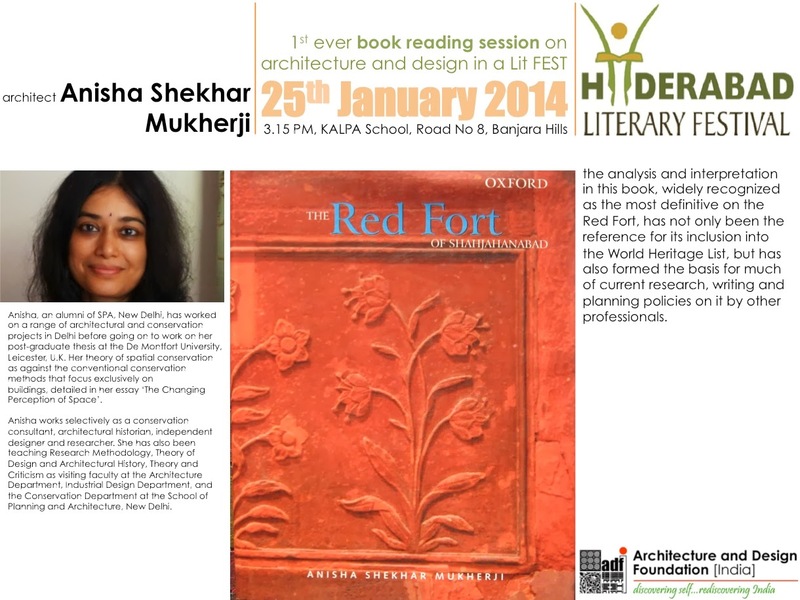 What can we learn from the Red Fort’s design that is relevant to our cities and towns today? First, that despite being the favoured residence and the prized patronage of the richest ruler in the medieval world, the Red Fort was planned and detailed to be socially inclusive–It was designed not just as a residence of a monarch but as a miniature city with all the positive opportunities for economic, social and cultural interaction that a city affords. Everyone, even the poorest of the inhabitants was a stake-holder in the Fort. Visually, and spatially too there was no bar between the direct axis linking Shah Jahan to his people–instead of the ramparts and barbicans that block the Fort from the city today, originally a bridge lead straight from the Chandni Chowk to the Lahori Gate, and further to the Emperor’s Throne of Justice in the Diwan-i-Am. Secondly, the Fort’s design was ecologically and environmentally considerate–there was no unnecessary wastage of resources-instead of the stretches of high-maintenance lawns that pass for gardens today, the Fort’s vast gardens were essentially orchards; they worked as productive areas as well as places of pleasure, entertainment and repose; they moderated the micro-climate and used only the optimum amount of precious water. Even the water in the fountains used to cool and decorate the Fort’s pavilions and its gardens, or in the imperial bathing chambers was recycled–either for irrigation, or for watering animals, or for cooling the public parts of the Fort. The palaces of the Emperor and his family as well as their grand entrance sequences which were a succession of forecourts and gateways were all multifunctional in use–they could equally be used for people to gather, for administrative work, for court ceremonial, as well as circulation spaces. And finally, the Fort’s design displayed those qualities which make design truly great, where no element is superfluous or extraneous. None of its structures and spaces was designed as simply utilitarian or purely decorative. Each component of its design—whether the form or detail of its gardens, pavilions, forecourts, gateways or colonnades was both useful and beautiful; the form, structure and decoration in them could not be separated from each other. ensure that the potency of its original design is physically conserved and communicated. In fact, the Fort’s ingenious planning and detailing have important lessons for not just for architectural and art historians, but also for contemporary designers and their clients, as well as for anybody who lives in this part of the world. Till this appreciation is confined to a few academics, there will never be any sustained support for the Red Fort, which above all, was a celebration of life–in its establishment, in the ceremonies that marked the Emperor’s sojourn in it, in the artists, painters, poets and singers that it patronized, in its gardens and in its trees that made life beautiful and pleasant even in the sweltering summers of Delhi. We need to reinstate all these aspects of the Red Fort’s past and its status as a cultural, architectural and artistic icon. What we need is a new method of conservation that involves people by presenting to them all the information that has so far been the domain of the scholar or the bureaucrat; that is planned and implemented in a manner that includes instead of disregarding the citizens of this country—whether as professionals, as visitors, as artists, as inhabitants, as students. We are—or should be—equally the stake-holders as well as the guardians of our history. Perhaps then we may be able to fulfill at least a part of the wish of the makers of the Red Fort, inscribed in good faith on the walls of the Khwabgah or the House of Dreams–Shah Jahan’s own sleeping chambers in the Fort. Nice post on Red Fort . It was built by the Mughal emperor Shah Jahan. The architecture is very incricate and visitors should know the Red Fort timings , entry fee etc to avoid hassle .